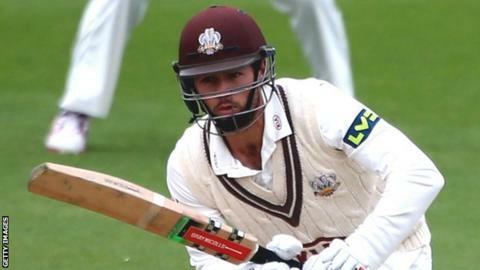 Batsman Ben Foakes hit a career-best 140 as Surrey dominated before bad light and rain stopped play on day two against Gloucestershire. Sam Curran (49) put on a 113-run third-wicket stand with Foakes before he was removed by Kieran Noema-Barnett (2-35). Noema-Barnett later trapped Jason Roy (39) lbw but Foakes' superb knock aided Surrey's innings as they reached 349-6. The umpires took the teams off due to bad light at 17:07 BST and play was finally abandoned by rain at 17:49 BST. Foakes enjoyed an excellent day at the crease, hitting 19 fours in his 140, surpassing his previous career-best of 132, which also came against Gloucestershire. Despite losing both openers before the close on day one, Surrey looked comfortable as they built a useful first-innings lead.